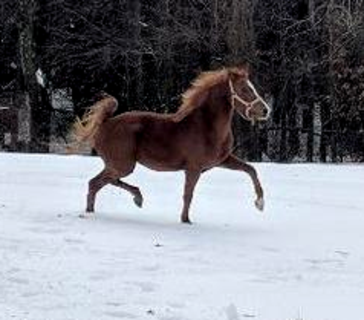 2015 Sport Pony Mare, by Golden State, out of TLF Macarena (Ridley, Old Acres St. George, Tetworth Tetrach). Rated Premier at inspection. Shown successfully in hand. 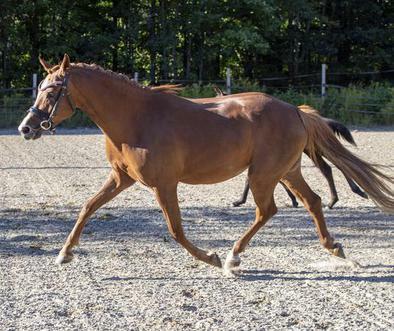 Three big powerful gaits, uphill with suspension. ​Confirmed in foal to Stibby Me for a 2019 foal! Video of Sire: Golden State, in Germany. 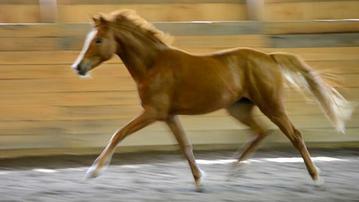 2011 - Licensed in Munster Germany in November as a Premium and Final Ring Stallion. 2015 NEDA Fall Festival of Dressage/Breed Show results-Reserve Champion Foal. 2nd place Current yr. Fillies, 1st place Sport Pony in hand Fillies/mares, High point NASPR. All at 2 months of age! NO PHOTO USAGE FOR SIM GAMES OR VIRTUAL STABLES.